Technology is part of everything we interact with. Unfortunately, while technology brings many innovative changes, it can also disrupt or destroy industries—take Uber for example. They completely transformed the transportation industry. Turning everyone into a taxi driver with the download of an app. This disruption is usually gradual, but established industry competitors rarely have the foresight to predict it. Industries must be aware of new business models and adapt quickly—or risk failure. Fully transforming into an agile, responsive organization requires changing people, processes, and technology. To achieve this digital transformation, you need a modern IT infrastructure with unified management and automation to take advantage of cloud resources, meet demand for new and improved applications, and support new ways of working. Together, Intel and Red Hat bring products to market faster, provide more value from the technology and achieve amazing security features, performance, and reliability in applications. 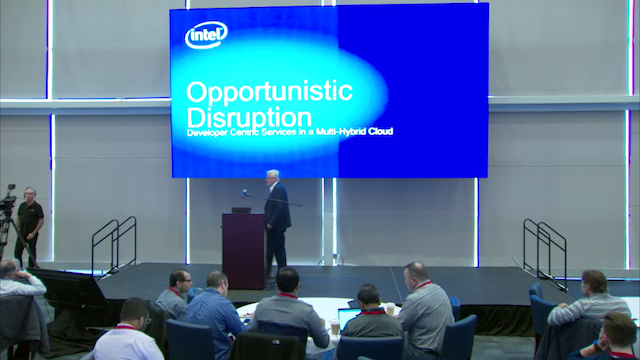 Explore the future of what Intel and Red Hat have to offer.